The government announced the appointment of two undersecretaries and five political assistants to its policy bureaus on Wednesday. Professor Sophia Chan Siu-chee, former head of the University of Hong Kong nursing school, will become undersecretary for food and health. Kevin Yeung Yun-hung, currently the principal assistant secretary for food and health, was appointed undersecretary for education. Chan, 54, began her career as a nursing student at Queen Mary Hospital in the 1970s, before moving into the academic field. She is now research director of HKU’s nursing school. Chan, an expert in health protection measures such as tobacco controls, will be deputy to Dr Ko Wing-man, head of the Food and Health Bureau. Yeung, 49, was administrative assistant to Secretary for Home Affairs Tsang Tak-sing for more than four years before moving to the Food and Health Bureau in 2010. He is the first administrative officer to leave the civil service and become a political appointee in Chief Executive Leung Chun-ying’s administration. The five new political assistants include veteran journalist and public relations consultant Carmen Cheung Sau-lai, who was appointed assistant to Chief Secretary Carrie Lam Cheng Yuet-ngor. Julian Law Wing-chung, a former journalist at the Chinese-language newspaper Ming Pao Daily, will become assistant to Financial Secretary John Tsang Chun-wah. The other three will serve in policy bureaus. Jeff Sze Chun-fai, a former executive director at the Savantas Policy Institute think tank, will join the Education Bureau. Zandra Mok Yee-tuen, who was the political assistant to the secretary for Labour and Welfare from 2008 until June this year, returns to that position; and retired chief superintendent of police Cassius Lau Fu-sang will join the Security Bureau. Chan and Cheung assume office on Thursday, and the others will follow later this month. Wednesday’s appointments were the third batch of political appointees named by Leung’s administration. The government has appointed five undersecretaries and one political assistant since June. Under the political appointment system, each of the 12 policy bureaus has one undersecretary and one political assistant. Two more political assistants are appointed to help the chief secretary and financial secretary respectively. The number of major environmental protests in China grew by 120 per cent from 2010 to 2011, according to Yang Chaofei, vice-chairman of the Chinese Society for Environmental Sciences. Speaking on Friday at a lecture organised by the Standing Committee of the National People’s Congress on the social impact of environmental problems, attended  by finance news magazine Caijing, Yang revealed that the number of environmental “mass incidents” has grown an average 29 per cent annually, from 1996 to 2011. According to Yang, the Ministry of Environmental Protection has handled a total of 927 incidents since 2005, 72 of which were classified as major incidents. He said that incidents involving heavy metal pollution and dangerous chemicals have been on the rise since 2010. The government stopped releasing most protest statistics several years ago after the annual number of “mass incidents” surpassed 100,000. The latest figure most often cited is from Tsinghua University sociology professor Sun Liping, who estimates there were180,000 protests and riots  in 2010. The Caijing report references recent information from Xinhua and the Beijing News, the latter of which responded to Yang’s claim that only 1 per cent of environmental disputes are resolved in court with an editorial calling for an overhaul of existing environmental law. Key problems, writes Beijing News, include abuse of protection from environmental lawsuits, and the lack of provisions allowing for lawsuits which seek compensation for environmental damage. Protests throughout the weekend  in Ningbo, Zhejiang province, were successful in stopping plans to expand a local plant producing the toxic chemical paraxylene, or PX. Protests defeated PX plants in Xiamen and Dalian in 2007 and 2011, respectively. 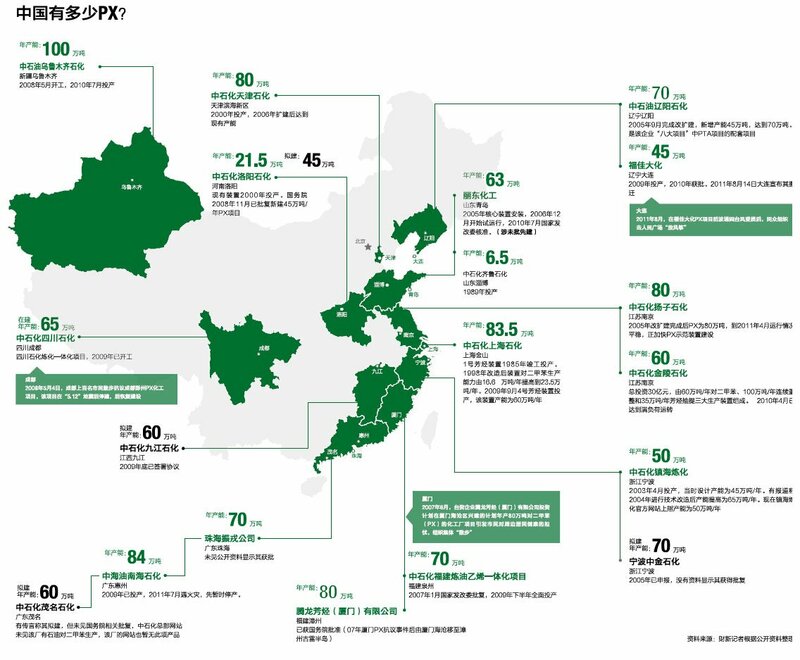 An infographic published by economic news magazine Caixin last week shows there are a total of thirteen PX plants  in China, the majority spread along the coastal region. Cache Creek Mayor John Ranta is demanding the removal of nearly 2,000 tonnes of hazardous waste ash that he says was illegally sent to the regional landfill his village hosts from Metro Vancouver’s Burnaby incinerator. Fly ash from the waste-to-energy plant’s scrubbers had higher than allowed levels of leachable cadmium in July and August but was shipped to the Cache Creek landfill because incinerator operator Covanta was slow to report the test results. Metro officials have said they are working with the environment ministry to determine whether the deposited fly ash must be removed. Some of the tested samples contained more than double the concentration of cadmium B.C. allows for dumping in municipal landfills. Ranta said the landfill isn’t licensed to accept hazardous waste and it was “simply wrong” for it to be sent there, putting landfill workers and the local environment at risk. Cache Creek residents don’t take such matters lightly, Ranta said, noting they blockaded the Trans Canada Highway to keep millions of dead chickens from being dumped there during the avian flu outbreak of 2004. Covanta has apologized for the reporting error, saying it was not intentional. Fraser Valley Regional District politicians say the incident underscores why they don’t trust Metro’s drive to build a new waste-to-energy plant. She noted the incident might never have been discovered or made public had landfill operator Wastech not realized in late September that the usual test results had stopped arriving and demanded them. When Covanta did hand over the results they did not flag the failed readings, according to a Wastech memo to Metro staff obtained by Black Press. “The company (Covanta) made no mention of the irregularity in the test results and made no mention of concern with the hazardous waste material sent to the Cache Creek landfill,” the Wastech memo said. It also reveals that it was Wastech’s decision, not Metro’s, to suspend all deliveries of fly ash to the landfill on Sept. 26 over safety concerns. Metro has instead been sending incinerator ash to a Hinton, Alberta landfill, after staging some of it initially at the Annacis Island sewage treatment plant. Subsequent loads of fly ash have tested within limits and Covanta is working to determine whether the exceedances were due to a testing error or the problems with the method used to stabilize the cadmium in the ash. The Burnaby incinerator burns 285,000 tonnes of garbage per year. Covanta is one of the expected bidders to build a new waste-fired plant, expected to handle 370,000 tonnes per year. As other nations throughout the world struggle to cut the amount of waste piling up in their landfills and marring the landscape, Sweden is facing an entirely different sort of challenge — they’ve run out of trash. Now they’re forced to import some more. Swedes, you see, are among the planet’s least wasteful people, on average recycling around 96 percent of the garbage they produce. And with what’s left, they’ve found a way to use, having implemented a world-class waste-to-energy incineration program capable of providing electricity sufficient to power hundreds of thousands of homes. But their hyper-efficiency has led to a unique problem: a trash shortage that could threaten the energy production capacity. So, what is Sweden to do? Well, according to Swedish officials, the notoriously tidy nation will begin importing garbage from their neighbor Norway — about 800,000 tons of it annually, in fact, to fulfill their energy needs. Perhaps the best part of all is that, in solving their problem, Swedes actually stand to profit from this endeavor; the Norwegians are going to pay them to take their waste, proving quite succinctly that one nation’s trash can truly be another’s treasure trove. A government study has shown that the city achieved its overall clean-air targets in 2010, cutting emission levels of four pollutants by up to 60 per cent compared with 1997. But this ignores the real problem – roadside air pollution – which just keeps getting worse. Since the study was released, Chief Executive Leung Chun-ying has named the environment as one of the deep-rooted problems he will address with an interventionist approach to governing, such as phasing out old diesel-run vehicles. And environment secretary Wong Kam-sing has said the government will consider tough measures, such as not renewing licences for diesel commercial vehicles more than 15 years old, which are among the chief roadside-pollution culprits. We trust this is a taste of things to come. Road transport accounted for 286,000 tonnes of sulphur dioxide pollution in 2010, up 15,000 tonnes in one year alone. When other countries are preparing to introduce Euro VI emission standards starting next year, Hong Kong still has 60,000 Euro I and II emission standard vehicles of 12 to 18 years old on its roads. Wong said what air-quality experts have been saying for years – that if Hong Kong is to tackle bad air seriously, it needs policies to specifically deal with roadside pollution. That said, the operators of polluting diesel vehicles are not breaking current transport and environmental rules, since their vehicles are licensed under them. One operator has warned, reasonably enough, that some will be prepared to take legal action to defend their right to continue to earn their livelihoods. Clearly, there will need to be effective incentives for drivers to upgrade willingly to acceptable standards. Existing subsidies have proven to be inadequate in value and coverage of the city’s 120,000 diesel vehicles. The government is right to be prudent with such handouts. But in this case it can be confident that the public would see cleaner roadside air – the stuff that we breathe – as good value for a lot of money. Controversial waste disposal plans including landfill expansion look set to return to the city’s agenda, even as residents call for the closure of the Tseung Kwan O rubbish facility. Undersecretary for the environment Christine Loh Kung-wai yesterday described landfills as a problem left by the previous administration. “Maybe I am unfortunate; the ‘wok’ [meaning a big mess] has landed in my lap,” Loh said. Loh was responding to criticism from a Tseung Kwan O resident that the government had done a poor job in managing waste in the past 15 years. Another resident also complained about the landfill. “It is so near our homes,” said Ng Mei-lan, 61, who lives on the 45th floor of a residential block in Wan Po Road, where dozens of rubbish trucks go past every day on their way to the landfill. The two were among about 100 residents Loh met at the Lohas Park Community Hall after her two-hour visit to the Tseung Kwan O landfill yesterday morning. They called for a complete shutdown of the facility this year. Loh said it was impossible not to expand the landfill, given the considerable amount of waste generated daily. The authorities would work on alleviating the problems, including the smell, noise, air pollution and the rubbish trucks. Residents had complained about leaked solid and liquid waste being left on the road, she said. Loh did not comment on the construction of incinerators as it is subject to judicial review. Secretary for the Environment Wong Kam-sing said waste disposal was a long-standing problem and required public consensus to resolve it. In April, the Environment Bureau abandoned a HK$23 billion plan to expand landfills in Tseung Kwan O, North District and Tuen Mun, and to build a waste incinerator on Shek Kwu Chau, off the southern coast of Lantau, as members of the Legislative Council public works subcommittee and Finance Committee withheld their support. Then-environment minister Edward Yau Tang-wah said new plans were needed before landfills became full in 2018. Scrubbers at Metro Vancouver’s waste-to-energy facility remove metals like cadmium before they go up the stack. But the ash collected was found to exceed provincial limits in July and August. But Metro wasn’t informed of both failures until Sept. 26 – about a month later than should have happened for the failed July test results and a day after Cache Creek landfill operatorWastech noticed the results were late and demanded the data. Gas flaring by oil and gas drillers contributes as much to climate change as the entire economy of Italy, according to data released by the World Bank, which called for an end to the practice. While flaring to burn off excess gas at drill sites has been cut 30 per cent since 2005, US$50 billion worth of gas is still wasted annually, according to the World Bank. New satellite analysis of the flares that commonly light the night skies in oil fields around the world suggests that bans and fines in some countries and the introduction of technology in newer oil fields has significantly reduced the pollution and waste in some countries but has failed in others. Excess gas burned off by the flares can be costly or inconvenient to otherwise capture, so some drillers simply burn it off to avoid the risk of explosions. According to the bank, Azerbaijan has cut flaring 50 per cent in two years and Mexico 66 per cent, while Kuwait now flares only 1 per cent of its excess gas. Other countries, including Qatar and the Democratic Republic of the Congo, now use large volumes of previously wasted gas to generate electricity. The bank’s estimates show that flaring was cut from 172 billion cubic metres a year in 2007 to 142 billion cubic metres last year. But most of the reduction came between 2005-07 and only six of the world’s big 20 oil-producing countries managed to reduce flaring last year. Flaring by those 20 nations produced a greater global warming effect than all output by Italy, the bank said. The figures show that the momentum to reduce flaring is now levelling off, with only 10 per cent overall cuts achieved by the world’s top 20 emitters since 2007 despite pledges to drastically reduce the practice. The US, ranked fifth for highest volume in the world’s gas flaring league table, increased the amount it flared by nearly 50 per cent in 2010-11 and has nearly tripled the amount it flares in the past five years, largely because of shale oil developments in places like North Dakota. Russia, by far the greatest flarer, burned off 37.4 billion cubic metres of gas last year, 1.8 billion cubic metres more than the previous year. The bank urged countries and companies to reduce flaring by at least 30 per cent over the next five years. “It’s a realistic goal. Given the need for energy in so many countries – one in five people in the world are without electricity – we simply cannot afford to waste this gas any more,” said Rachel Kyte, World Bank vice-president for sustainable development. Oil companies agreed that the waste of the gas that could be used for power was a problem, but said it took time, money and technology, as well as infrastructure developments by host countries, to make cuts. Sweden, birthplace of the Smörgåsbord, Eric Northman, and the world’s preferred solar-powered purveyor of flat-pack home furnishings, is in a bit of a pickle: the squeaky clean Scandinavian nation of more than 9.5 million has run out of garbage. The landfills have been tapped dry; the rubbish reserves depleted. And although this may seem like a positive — even enviable — predicament for a country to be facing, Sweden has been forced to import trash from neighboring countries, namely Norway. Yep, Sweden is so trash-strapped that officials are shipping it in — 80,000 tons of refuse annually, to be exact — from elsewhere. You see, Swedes are big on recycling. So big in fact that only 4 percent of all waste generated in the country is landfilled. Public Radio International has the whole story (hat tip to Ariel Schwartz at Co.Exist), a story that may seem implausible in a country like garbage-bloated America where overflowing landfills are anything but scarce. As mentioned, the solution — a short-term one, according to Ostlund — has been to import (well, kind of import) waste from Norway. It’s kind of a great deal for the Swedes: Norway pays Sweden to take its excess waste, Sweden burns it for heat and electricity, and the ashes remaining from the incineration process, filled with highly polluting dioxins, are returned back to Norway and landfilled. A boss at Veolia has said he would not want to live near one of his firm’s waste incinerators. Speaking at an industry policy event, the waste giant’s executive director for external affairs, Robert Hunt, said planning for waste facilities was a big issue because nobody wanted one built near them. “I don’t think I’d want a waste facility near my home, I have to say”, Hunt added. He said that while “in a democracy everybody’s got to have their say” on planning issues, the time taken to get planning permission made it difficult to attract foreign investment. The infrastructure planning system needed to be faster and more efficient, he added. Chief operating officer at the London Waste and Recycling Board (LWaRB), Wayne Hubbard, disagreed with Hunt. Hubbard, also speaking at the Westminster Energy, Environment and Transport Forum event, said the planning system was delivering waste infrastructure. The regime, he argued, distinguishes between large thermal treatment plants and smaller waste facilities which are less problematic. “I don’t buy this received wisdom that planning is an issue”, he said, “but planning is definitely an issue for certain types of infrastructure”. Hubbard said there was a need to focus more on smaller merchant facilities with more flexibility to respond to changes in market requirements. “It’s okay to have the big waste infrastructure as long as it’s backed up by a load of other stuff that will come from entrepreneurial, smaller waste management companies”, he said. Campaigner Shlomo Dowen of UK Without Incineration Network slammed Hunt’s comments on planning. He said the firm had a “blind spot” in respecting local residents and Hunt should “stop blaming the people for shortcomings in Veolia’s business model”. “Growing rejection of incineration is about much more than the planning system”, added Dowen.